The wonderful news about today's high tech braces is that you can pretty much eat anything that you want! There are some foods that you should avoid, but they are pretty much the sticky, crunchy, chewy, gummy things. These foods include jube jubes, gummy bears, popcorn, and chewing gum. If you have a concern about a certain food, please ask us. There are also some foods that should be eaten a little differently. These foods include carrots, apples, and corn on the cob. Our well-trained staff can teach you how to eat these foods and avoid problems with your braces. When the wrong foods are eaten or the right foods are eaten in the wrong way, a brace may break off your tooth. This will make your orthodontic treatment longer to finish. Interestingly, biting on pens, pencils, and fingernails is the worst habit that causes a brace to break off a tooth. So if you have any of these habits, please try to stop them immediately. Remember, brace breakage equals longer treatment time. "My teeth feel loose and sore!" This is the most common thing that patients tell us after their teeth start to move with braces. You can relax because it is totally normal for everybody! After the wire is placed into the braces, the teeth begin to move. In order for a tooth to move, it must loosen up in the bone. Don't worry, because after the treatment is finished, the teeth will tighten up in the bone again. Tooth soreness usually lasts about two to four days when the teeth first start to move. After a wire adjustment appointment, it may last only a day or two or even a few hours. If your teeth are sore, it is best to eat softer foods. You can take a pain reliever like Advil or Tylenol if you wish. The lips, cheeks, and tongue will need to get used to any orthodontic devices placed in your mouth. Most times, they do it without you even knowing. However, should your lips, cheeks, or tongue become irritated, you can use the soft clear wax that was given to you in your start-up kit. Simply place the wax right over the face of the brace. In a very short time, your lips, cheeks, or tongue will toughen up and you won't need to use the wax any more. Of course, our office has lots of extra wax if you need it. Just ask. The orthodontist and the patient must work together in order to create a beautiful, healthy smile. Your teeth and jaws will only move into their ideal positions if you follow the instructions that Dr. Steiman and his staff give you. Consistent wear of elastics, headgear, or any other orthodontic device is critical to the final outcome of your bite and smile. Inconsistent wear or broken devices only leads to longer treatment times, and often, increased costs. Rumour has it that anyone who has braces plays their sport better! Maybe it is because you feel so much more confident in yourself as you help create your beautiful, healthy smile? If you play contact sports, it is important that you protect your teeth and braces with a sports mouthguard. At Dr. Steiman's office, mouthguards are complimentary with your treatment so please let us know if you need one the day your braces go on. In the event of a sports accident, check your mouth and all orthodontic devices immediately. If you notice any loose teeth or any broken orthodontic devices, then call our office right away. We will bring you in to properly assess and treat any damage that may have occurred. Brushing and flossing your teeth with braces on is more important than ever! 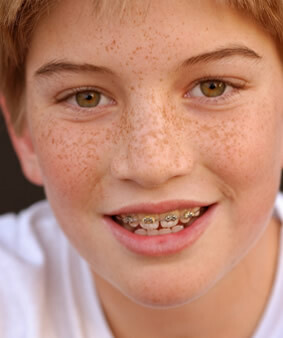 If your teeth and gums are not kept healthy, you may develop PERMANENT stains or cavities around the braces. Fortunately, all toothpastes contain fluoride which helps harden the tooth enamel, making it less susceptible to staining and cavities. Dr. Steiman strongly recommends nightly rinsing with a fluoridated mouthwash in order to strengthen the enamel while you sleep. Regular checkups and cleanings with your regular dentist are strongly advised during the entire orthodontic treatment period. Adults with a history of gum or bone disease may need to see a periodontist before and during orthodontic treatment.